Download and install latest HP photosmart c5180 all-in-one printer drivers for windows 32/64 bit OS and Mac OX. HP c5180 Printer driver enhance your printer performance by downloading scan driver, basic driver and full featured software from the table below. HP photosmart c5180 high quality printer comes with built in card reader enable you direct photo print with out system requirement. It has lots of options for photo printing, network ready which supports both Windows and Mac PCs. 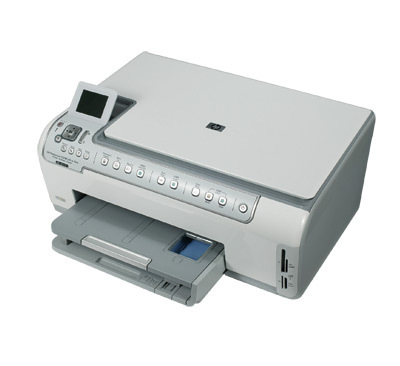 HP c5180 has digital copier type with Ink-Jet-Color-Photo printer printing technology, 3000 impressions for monthly duty cycle, display diagonal size of 2.4 office Machine feature print from memory card, width 17.6 depth 15.2 height 7.4 weight 20.9lbs. HP photosmart c5180 color printer supports flash memory (compact flash), Memory Stick, MultiMediaCard, SD Memory Card, XD-Picture Card, Memory Stick Duo and Memory Stick Pro. The copying speed includes Max Copying Speed 32 pages/min (mono) up to 31 pages/min (color); Max Copying Resolution up to 4800 x 1200 dpi (mono) / up to 4800 x 1200 dpi (color); Gray Scale Half-Tones 256; Max Document Enlargement 400 %; Max Document Reduction 50 %; maximum copies 50. The printing technology includes Inkjet Technology with HP Thermal Inkjet; max printing resolution up to 1200 x 1200 dpi (mono) / up to 4800 x 1200 dpi (color); max printing speed 32 pages/min (mono) / up to 31 pages/min (color); Ink Palette Supported (Colors) Cyan, magenta, yellow, black, light cyan, light magenta; colors of 6-ink; Printer Drivers / Emulations PCL 3; Ink Type HP Vivera Inks. The scanning technology includes Optical Resolution 2400 x 4800 dpi; Interpolated Resolution 19200 x 19200 dpi; Gray Scale Depth 8 bit; Color Depth 48 bit. It has PC connectivity with hi-speed USB. It supports MS Windows XP, Apple Mac OS X 10.2, Apple Mac OS X 10.3, Apple Mac OS X 10.4, Apple Mac OS X 10.3.9, MS Windows 2000 SP3 or later, MS Windows XP Tablet PC Edition, MS Windows XP Media Center Edition. It requires AC 110/230 V (50/60 Hz) with consumption operation of 16 Watts. Min Copy Weight 75 g/m2; Max Copy Weight 236 g/m2; Supported Media Type Cards, Labels, Envelopes, Photo paper, Plain paper, Transparencies; Standard Media Capacity 100 sheets; Output Trays Capacity 50 sheets. The other details include Input tray – 100 sheets – Legal (8.5  x 14 ) weight: 75 g/m2 – 200 g/m2 , Input tray – 20 sheets 4 x 6  – 236 g/m2 , Output tray – 50 sheets – Legal (8.5  x 1 ) weight: 75 g/m2 – 200 g/m2. The speed details include printing up to 32 pages/min – B/W draft , printing up to 30 pages/min – B/W fast normal , Printing up to 8.5 pages/min – B/W normal , Printing up to 0.4 pages/min – B/W best , Printing up to 31 pages/min – Color draft , Printing up to 24 pages/min – Color fast normal , Printing up to 5.3 pages/min – Color normal , Printing up to 0.4 pages/min – Color best , Printing 12 sec ( 4 in x 6 in ) – Photo draft , Printing 27 sec ( 4 in x 6 in ) – Photo fast normal , Printing 54 sec ( 4 in x 6 in ) – Photo normal , Printing 145 sec ( 4 in x 6 in ) – Photo best , Copying up to 32 pages/min – B/W draft , Copying up to 31 pages/min – Color draft. Now go ahead and insert back the cartridges. This work and normal printing will start.